U.S. stocks slipped from record levels on Wednesday as Wall Street digested a mixed batch of corporate earnings. The Bank of Japan is set to release its monetary policy statement later on Thursday, with interest rates expected to remain unchanged. Stocks in Japan were set to see opening gains on Thursday despite an overnight dip on Wall Street following mixed earnings results stateside. Futures were little changed in Japan and Australia and pointed lower in China. The S&P 500 Index closed lower after mixed reaction to results from AT&T Inc., Caterpillar Inc. and Boeing Co., while Facebook Inc. shares rose after hours following better-than-expected revenue. The yen pared losses ahead of the Bank of Japan’s policy decision. 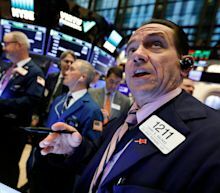 In a week when the S&P 500 hit an all-time high, the global chief market strategist at Cantor Fitzgerald boosted his year-end target for the benchmark to 2,500 from 2,390. The new forecast represents a 15 percent drop from the current level, still putting him as the most pessimistic among 25 strategists tracked by Bloomberg. Stocks have surged this year, sending the S&P 500 up 17 percent, as investors jubilate over a dovish Federal Reserve and bet a profit slowdown will be short-lived. Snap added users and grew revenue in the first quarter, and Occidental Petroleum made a hostile bid for Anadarko Petroleum.